The applet below illustrates problem 7 from the 2009 Australian Mathematical Olympiad. Let I be the incenter of a triangle ABC in which AC ≠ BC. 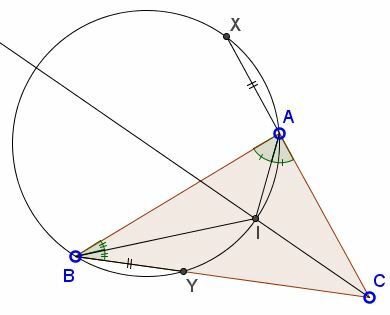 Let Γ be the circle passing through A, I and B. 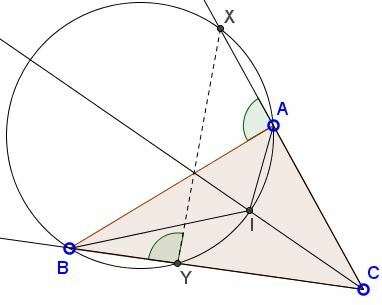 Suppose Γ intersects the line AC at A and X and intersects the line BC at B and Y . Show that AX = BY. The condition AC ≠ BC is obviously a red herring as, in this case, A = X and B = Y. The applet illustrates a fifth solution (see below) to the problem. This is a well known fact that a circle through two vertices of a triangle cuts a chord (XY in the applet) antiparallel to the side joining the two vertices (AB in the applet). In particular this means that ∠BAX = ∠BYX. In both cases the arcs XA and YB are equal, implying the identity of the subtended chords.